On Memorial Day, we honor the men and women who have died serving our country. We owe these people a debt we can never repay. We take for granted that we can start our own businesses and elect people to represent us in government. We take for granted that we can worship – or not – as we choose. We take for granted that we can own a gun, a home, and stock in Fortune 500 companies. We take for granted that these freedoms will be ours forever. Recently, a court in Colorado decided that displaying your middle finger to a police officer in the universal gesture of contempt was not harassment, but was legitimate free speech. Shane Boor’s (Yes, that’s his real name; it fits, doesn’t it?) gesture is a First Amendment right that cannot be taken away by the government. Do you suppose that Mr. Boor is cognizant of the fact that his right to shoot the bird at a cop has been protected by American soldiers who have fought and died for more than 200 years? I certainly hope he is. On behalf of Mr. Boor and myself, I honor those patriots who have given their lives to protect the United States of America. Freedom is never free, and you are the ones who have paid the ultimate price. We remember, and we are grateful. “What?” he asked, pretending innocence. We have this same conversation every Thursday night. “Really? I don’t smell anything.” He sidled closer to me. “Aw, a little cigar smoke never hurt anyone,” he answered. “I know there’s a ‘but’ in there somewhere,” he laughed. “The sarcasm I could do without,” he mumbled as he climbed the stairs. I grinned. Thursday was smelly night at the Scullion house and all was right with the world. To be completely honest, Jack Nicholson actually said “Wendy, I’m home!” in The Shining. Hi Honey, I’m Home was a short-lived TV sit-com in the early 90’s. There’s a good reason it wasn’t on for long and why you’ve never heard of it. As for the origin of the statement “Hi honey, I’m home”, I suspect a caveman first said it to his wife as he dragged a wooly mammoth carcass into their cave. Texting acronyms: Are you down with it? It seems to be a rite of passage that young people develop their own language, thereby mystifying and confusing their elders. This, of course, is the purpose. 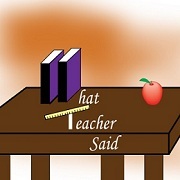 The generation gap is widened by the language barrier that exists between the age groups. Say Daddy-O. Let’s hear some of that Rock-n-Roll. You got Jailhouse Rock on a 45? Elvis really knocks my socks off. Like, wow, man. That tune sets my soul on fire, ya dig? Dylan is like, far out. Groovy, man. That Snoop Dog’s phat, homie. Fo’shizzle. Kids today text more than they speak; their language is an offshoot of this new technology. R U going 2 C Justin Bieber 2 nite? The above texting example is fairly simple and can be deciphered with a minimum of effort. However, other text shortcuts are unreadable without a dictionary. What the heck are “ROFLMAO” and “YMMV”? The elderly (anyone over 30) have found that many of the acronyms currently used by the kids don’t apply to us. I feel silly using S^ (S’up – a.k.a. What’s up?). I wouldn’t say it; I won’t write it. I’m not the only one in the geriatric set who feels that way. An ingenious FB (FaceBook) user has posted some acronyms designed just for us. 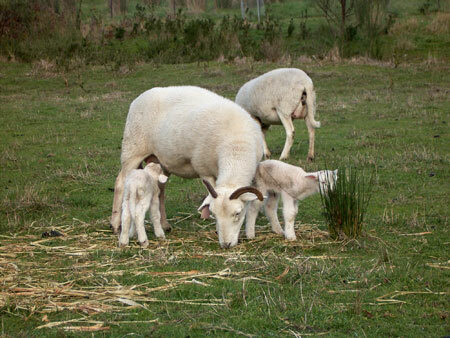 OK, so exactly what is the High Output Ovine Vegetation System? Isn’t it wonderful when nature and man have mutual goals? I mean, really, how often does that happen? Network Rail, the company in Great Britain responsible for maintaining the country’s rail tracks, has just hired a group – excuse me, that would be a flock – of sheep to protect a field that is home to a variety of rare native plants. The plants are threatened by brambles and hawthorn scrub (a.k.a. weeds) that grow wild, crowding out the native plants. You may wonder, as I did, how putting a flock of sheep in this field will protect the rare plants. Sheep eat plants, right? Right. Here’s where the beauty of nature and man working together come in. These particular sheep, Wiltshire Horn sheep, are perfectly suited to the task at hand. They are short fleeced and their fur moults in the spring, so they don’t get caught on the brambles AND they only eat the brambles and scrub plants. You got it – they don’t eat the rare plants! To date, the company has been paying 50,000 British pounds a year to get rid of the weeds. Now, thanks to the Huntingdonshire District Council who loaned the sheep and a shepherd to the company, Network Rail and British taxpayers are paying absolutely nothing. The humans, the sheep and the native plants are all happy. Problem solved. You’ve got to love it, don’t you? 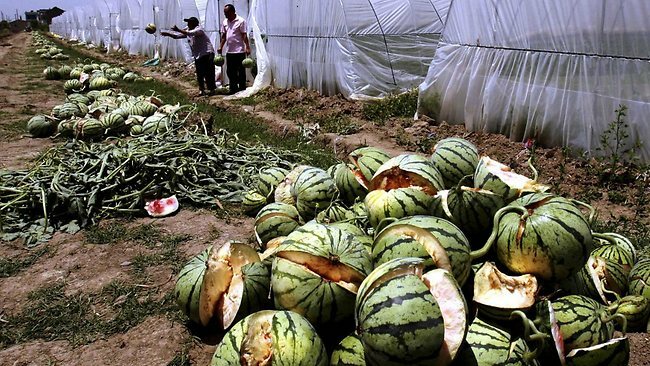 Watch Out for the Exploding Watermelons! The New London Health Center is in Snellville, GA. It’s an old-fashioned kind of nursing home, if you know what I mean. It smells like the Brussels sprouts that were served for lunch, has too few nurses for the kind of care the residents need, and there is always someone down the hall yodeling out of tune opera or frantically wanting to know where they are and how they got here. It’s the kind of place that makes you hope you’ll get hit by a bus when it’s your time to go. You don’t want to end up here. Lily is 85 years old and bedridden. She has been a resident at New London for two long years now. A former teacher, it’s hard to believe that she’s content to simply sit and stare out the window of her room. She was so vital, raising four children of her own and educating hundreds of other people’s children. Her room is filled with books, but her eyesight is so bad she can’t see well enough to read. She can’t stand to watch TV; the news shows repeat a litany of disaster and doom that would depress anyone. Two of her sons live in other parts of the country, one son committed suicide last year, and the one who lives nearby never comes to visit. She can’t blame him, really; it’s a sad place to visit and she’s a sad shadow of herself. If you visit her, she’ll ask you to tell her why she’s here. She doesn’t mean New London; she wants to know why she’s still alive. Gertie hasn’t been at New London quite as long as Lily has. Gertie is the “difficult” woman on the hall. She curses at the nurses in German, refuses to do as she’s asked, and sometimes rolls her wheelchair into places that are off limits to residents. If she feels like it, she’ll tell you about her struggles to get out of Germany during WWII. If she doesn’t feel like it, she’ll tell you to go to hell. Sometimes, she gets confused and thinks that the home is a Nazi camp. She’ll whisper to you to get out while you still can. If you visit her, she’ll ask you to tell her why she’s here. She doesn’t mean New London; she wants to know why she’s still alive. Helen is one of the few women at New London who can still walk. You’ll see her pushing her walker all around the home. She smiles when she sees you, and she wants to know about life outside of New London. She’s charming and patient with the nurses. Unfortunately, she has a heart condition, and has to wear a monitor. She needs the nursing care that the home provides, and she knows she’s never going to leave New London. It will be her home for the rest of her life. Some days when she’s down – and those days are rare – Helen will ask you to tell her why she’s here. She doesn’t mean New London; she wants to know why she’s still alive. Life takes us on a wild ride. The opportunities that present themselves and the choices we make lead us…somewhere. There are too many variables in life to be sure of the consequences of any decision we make. Many times, we can’t even connect the dots; life seems random. I have no answers for these women who have lived full lives and now want nothing more than to have the pain stop. I can only tell them that they are making a difference in my life, that I am a better person for knowing them. Some days that’s enough. New London Health Center, a nursing home in Snellville, GA received a 2 out of 5 overall rating from CMS of the Dept of Health and Human Services on January 7th 2011. This score means that New London Health Center is rated below average overall based on health inspections, nursing home staffing and quality measures. Our new puppy Wreck has chosen Alex to be the center of his universe. This honorary position, while flattering, has caused Alex no little trouble. He doesn’t remember when our other dogs were puppies. He remembers the dogs that were trained to come when called, walked nicely on a leash, and were perfectly happy napping next to you on the sofa. Wreck doesn’t do any of those things. Right now, Wreck’s favorite activity is picking up shoes and carrying them from place to place. He doesn’t chew on them; he just carries them around the house. Luckily for the rest of us, he prefers Alex’s shoes. Alex owns 3 pairs of flip flops, a pair of slippers, a pair of canvas boaters, 2 pairs of athletic shoes, and a pair of black dress shoes. This morning he couldn’t find 2 shoes that matched. I’m sure he was late for school. I have been trying to put an end to this particular habit. However, the boy simply will not put his shoes away in his closed closet the way the rest of us do. Since I have been asking him to do this for 17 years now, I guess it’s time to stop beating my head against the wall. I suspect that it will be easier to train the puppy not to touch the shoes. I’ll get right on that as soon as the sight of the 10-pound toy poodle dragging Alex’s size 12’s around the living room no longer makes me laugh. It may be a while. Taking home T-shirt souvenirs? That's so last week! So how many of you own a t-shirt that says “My grandparents/parents/sister/son went to Antarctica/Paris/Atlanta/Detroit and all I got was this lousy t-shirt”? Don’t be shy. Believe me, you are so not alone. We all have these shirts tucked in the bottom of a drawer somewhere. We don’t wear them because, although it’s nice that our relatives think of us as petite people, the fact is that we really do need the XL instead of the M. We don’t throw them away either, because darn-it-all grandma/aunt/sister schlepped it all the way back from Hong Kong and she had to pay the extra baggage fee to do so. It would be disrespectful to get rid of it, don’t you think? Of course it would. The Prague Zoo is now offering an interesting souvenir that grandpa/uncle/daughter can take back to those relatives at home in Kansas City/Tunbridge Wells/Tokyo. Instead of an undersized t-shirt, why not take home a 2.2 pound container of elephant dung? I bet your cousin/brother/friend doesn’t already have one. It is one size fits all, so you don’t have to worry about buying the wrong size. At a bargain price of about $3.90 (USD), it is indeed the perfect souvenir to take to the person who has it all. What do you do with your 2.2 pound container of elephant poop if your grandparent/cousin/sister gives you one as a souvenir from Prague? The local Czech gardeners say it makes outstanding fertilizer for your garden. Unfortunately, containers of elephant dung don’t appeal to some tourists. Ana Tolentino, a Brazilian tourist interviewed by an AP reporter in Prague, says that she wouldn’t buy it no matter what it costs. She does admit, though, that “it is very unusual!” I guess there’s no accounting for taste, Ana. Star Trek Maquis Take Out Osama Bin Laden? Yes, it’s true. The Maquis, a group of extra-terrestrial terrorists from Star Trek’s Deep Space Nine series, is responsible for killing Osama Bin Laden. This has been verified by German news station N24, who stunned the world with this announcement on May 5th. The operation was more complicated than anyone imagined. The Maquis spaceships first had to travel back in time from the 24th century. A complicated series of math and physics algorithms were required in order for them to arrive in the exact place and time they needed. One slight miscalculation and the Maquis might have found themselves in 1950’s Montana. The potential for error is mind-boggling. Since earth still lacks space ship docking stations, the Maquis then had to travel to bin Laden’s complex in Pakistan using a machine called a “transporter” that breaks down physical objects into their basic molecules. These molecules are then moved to the programmed coordinates and reassembled into their original structure. As you can imagine, this is a very difficult process. Transporters are known for being highly unreliable. We can only be grateful that they were operational for this mission. Of course, the weapons used by the Maquis were more advanced than anything on earth today. Phaser wounds simply cannot be confused for bullet wounds. This accounts for the fact that bin Laden was quickly and quietly buried at sea. President Obama, while no doubt stunned by the Maquis operation, covered the evidence of extra-terrestrial assistance without blinking. If it hadn’t been for a German journalist, the whole operation would have remained covert. Note: I mean no disrespect to the US Navy Seals, who are truly heroes. Thank you for sending Osama bin Laden back to hell. Brandon stretched slowly and sighed. He’d thought it was supposed to get easier after you died, but he’d found out for himself that death wasn’t all it was cracked up to be. Where were the angels with the harps? Where was the billowy white cloud that had his name on it? He was pretty sure he hadn’t landed in – you know – hell, which was a plus. There weren’t any red devils with pitchforks, and it wasn’t any hotter than a Georgia summer. Anyway, he couldn’t think of anything truly bad he’d done in the thirty-four years he’d spent on earth that would have landed him in – you know – hell. How long had he been here now? It was difficult for him to keep track. The motorcycle accident had happened in the late summer and it was now – he squinted to peer through the mist that seemed to be getting deeper with each passing day – spring. He could smell the honeysuckle that climbed over his sister’s back fence. It was definitely spring. Must be about six months then. Six months of watching the people he’d left behind. He scratched his chin and considered that for a moment. Maybe he was in – you know – hell, after all. His parents had never gotten over the horror of burying their only son. They’d aged a lot in the last six months. His sister tried to keep it together for her daughter and for their parents. His death had hit her like a ton of bricks, but she refused to show it. She hadn’t even cried at his funeral. It wasn’t fair that just when he’d decided to settle down and grow up, he’d had that stupid accident that had ended it all. He’d even gotten a puppy; he’d needed something to care about and someone who needed him. The little guy had been perfect for him. It hadn’t worked out the way he had planned it though. He wished now that he hadn’t asked his sister to take care of the dog. Melissa had promised him she would as he gasped his last breaths, but he could see now that the puppy was just one more chore for her. She kept it in the backyard and fed it, but that was all. She couldn’t even stand to look at the poor thing. The dog was a tangible reminder that her brother was dead. His puppy was neglected and lonely. His beloved sister was an emotional wreck. She wouldn’t be able to heal until she came to terms with the fact that he was dead. Brandon felt their pain writhing inside him and wished for the thousandth time that there was something he could do to help them both. Being dead was horribly inconvenient. He sat next to the puppy for a while, and then got up and went into his sister’s house. He blinked in surprise to find it empty. There wasn’t a stick of furniture left in the entire house. Melissa had moved out? When had that happened? And why was his puppy still in the backyard of this abandoned house? He focused on his sister, and found her settling into a house on the other side of town. She was taking glasses out of a moving carton and putting them in the dishwasher. She had music playing, but she wasn’t singing along. Her every movement was deliberate as she simply plodded through the motions of living. Melissa started the dishwasher and then sighed deeply. There was only one thing left to move out of the other house, and she couldn’t put it off anymore. She grabbed her car keys and got into the car. Lily, her10-year-old daughter, jumped into the passenger seat without saying a word. She knew where her mom was headed, and she knew her mom would need her. Brandon touched his young niece on the shoulder and smiled when she unconsciously put her hand over his. She was sensitive, a special girl. Brandon headed back to the dog; he had an idea. He had noticed a woman walking past his sister’s house every afternoon. She smiled wistfully at her neighbors who were walking their dogs, but she didn’t have one of her own. He saw her coming up the hill today, and hoped that she was “the one”. With a wave of his hand, he opened a small hole under the fence. The puppy crawled under the fence and stood in the front yard. Waiting. “Hey there, little one,” the woman cooed when she saw the dog. She bent down to see if he had on a collar, and he jumped up into her arms. “mmm…no tags.” Brandon smiled. She didn’t seem to mind that the puppy was filthy and covered with fleas. She held him close and kept moving up the street. A neighbor, shaking her head in disgust, let her know that Melissa had moved out and had obviously left the dog behind. The woman headed home, his puppy cuddled in her arms. Brandon was a sucker for happy endings. Lily ran into the backyard. She saw the small hole under the fence and wasn’t surprised to find the dog gone. Melissa sat on the front steps, her hands shaking. The only thing Brandon had asked her to do was to take care of his dog, and now she’d lost him. Lily knocked on the door of the house next door and was told about the woman who’d taken Uncle Brandon’s dog home with her. “I know where the dog is, Mom,” Lily said, coming back to sit next to her mom. Melissa jumped to her feet. “Let’s go get him, then.” She was incredibly relieved. Brandon put his arms around his sister and niece. He was satisfied that Melissa was going to be OK now. He didn’t know how he knew it, he just did. Just as he knew that he was about to find out what being dead was really like. It's an insult to refer to your dog as a pet? Since when? “We need to get a dog, Mom.” Alex had a cute pout on his little face, and his pleading blue eyes were adorable. Unfortunately for him, I was distracted by the fact that he had to look down at me since he now topped six feet. “I’ve been traveling a lot, and it’s not fair to a pet to leave it in a kennel,” I answered. Oh dear. They were ganging up on me. Chris and I had dogs before we had the boys, so this was the first time in their lives that we haven’t had a canine companion animal. It has been a long year since Buffy passed away. “All domesticated animals are supposed to be called companion animals according to the Oxford Centre for Animal Ethics,” PJ explained earnestly. “They were all just hiding the pain they felt when you called them pets,” PJ replied. He was doing his best to keep a straight face. Alex laughed out loud. Alex filled in the blank with “crazy”. I waved and shut the door behind me. I couldn’t bring myself to give a definitive “no”. I love dogs. I live in Georgia, which is about as far as you can get from California and still be in the continental United States. It still isn’t far enough to keep us from hearing about the strange things that happen there. It seems to me that many of the people who live in California are nuts, crazy, bonkers, off their rockers, certifiable, loony, strange, a card short of a full deck, etc. If you have to make a nod to political correctness – and you are required by law to be PC in California – you can call them eccentric, bless their hearts. In case you’re wondering, no actual vomiting took place. Yes, I thought that was disappointing, too. Protest leader and former circus clown Chicken John Rinaldi bought $750 worth of fake vomit which was used to decorate the park during the protest. No doubt it added that touch of elegance the park lacked. Unfortunately, the Recreation and Parks department has decided to go ahead with privatizing food trucks in Dolores Park since Chicken John was unable to offer a viable alternative to cover the budget gap. It was a sad waste of perfectly good fake barf. We can only hope that Chicken John can find some way to reuse, recycle or repurpose it. “Excuse me?” I could see by my husband’s expression that he was about ready to fall out in shock. I handed him a paper bag in case he started to hyperventilate. Alex, my 17-year-old, chuckled. “‘Virtual’ friends aren’t real, Mom.” He made a big deal of putting air quotes around the word virtual. My “mom frown” doesn’t work on him anymore. He laughed at me. “They are so,” I answered. Unfortunately I sounded like a grumpy little kid. Sticking my tongue out at him didn’t add that touch of sophistication I would have liked to project either. “Anyway, I’ve decided to take up ice sculpting,” I announced with a smile. “You mean the kind of ice sculpting Bill Murray did in Groundhog Day? How are you going to manage that in Georgia in the summer?” Chris frowned at me. He knows me too well. Chris and Alex walked over to the freezer and pulled the door open. “No,” they answered in unison. Chris groaned. “It’s going to take me all day to fix this.” Alex tried to sneak away, but Chris grabbed him by the collar of his t-shirt. “It’s going to take us all day to fix this.” Now it was Alex’s turn to groan.